Government of India has launched ‘swachch Bharat Mission’ to achieve sanitation and cleanliness by 150th birth anniversary of Mahatma Gandhi in 2019.As part of cleanliness drive Air Force Station Jalahalli has instructed Air Force School Jalahalli to conduct Swachhta March by students and teachers on 3rd Dec 2016. 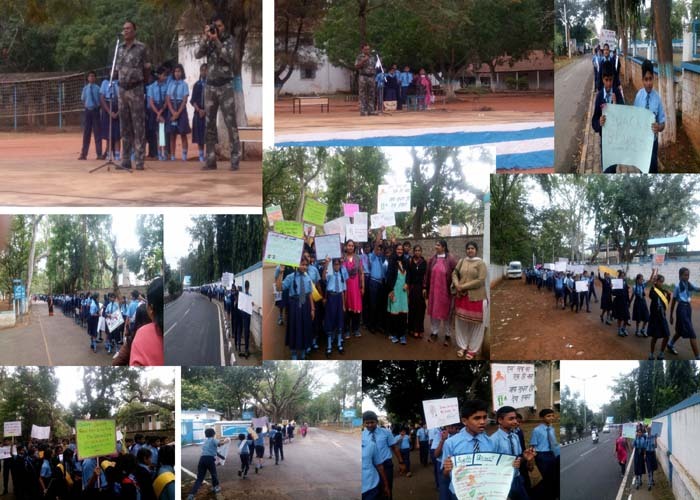 Our school has conducted the march with all its enthusiasm as per the guideline issued by the station. The programme started with a speech delivered by Students of class 6th to 10th and teachers took part in the march. Hundreds of banners,badges and saches could be seen. The rally call ‘Clean India’ echoed every where. The entire march instilled the spirit of nationalism in their mind. Paying homage to one of Mahatma gandhi’s tenets –‘Clleanliness is next to godliness.’the march could inculcate the spirit of hygiene and cleanliness in our children.We are proud to be part of this great national endevour.